Houseboating can be a lot of fun for any age, size or type of group. 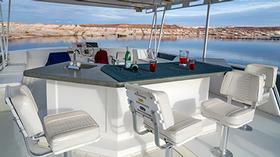 Houseboats can generally sleep up to12 people which is ideal for families and friends. And pets are welcome! Many boats have a stove, an oven and a barbecue, so the choices for cooking are varied. If you have a ski boat, fishing boat or runabout, you should bring it. If you don't have a small boat you may want to consider renting one for the week, or at least for one day of your trip (small boat rentals are available at most locations). Water-skiing adds a fun dimension to the houseboat trip. Jet Skis, WaveRunners or other personal watercraft are an exciting alternative, or just relax and enjoy the wildlife. A few choices are listed below. HiddenCalifornia.com is not a travel agency and does not make reservations. sites listed herein, and claim no responsibility for results of their business transactions.